For the third year in a row [2012, 2103], Jack went to the Jesuit Homecoming. He went with Bridget. Sharon and I picked up Bridget and her friend Marie at Marie's house and took the three of them to Granite Bay. 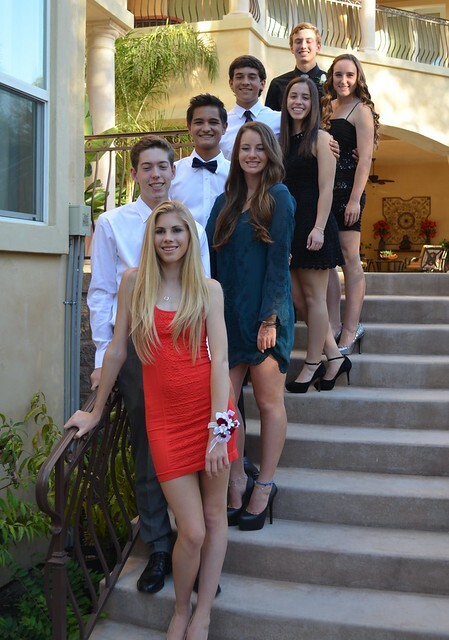 After pictures, the kids took off for dinner at Paul Martin's and then to the dance. Sharon and I spent some time visiting with Ethan's parent before having a late dinner at Mikuni's in Roseville. Having dinner, we watched Brandon Belt hit a home run in the top of the 18th to win game two of the MLB playoff series versus the Nationals. Jack, Bridget, Alex and Marie ended up at our house after the dance. We eventually took the girls back to Marie's house. Alex spent the night.